The Franciscan Abbey of Ross Errilly was founded in 1349 on the banks on Black River on the Galway-Mayo border near the town of Headford. 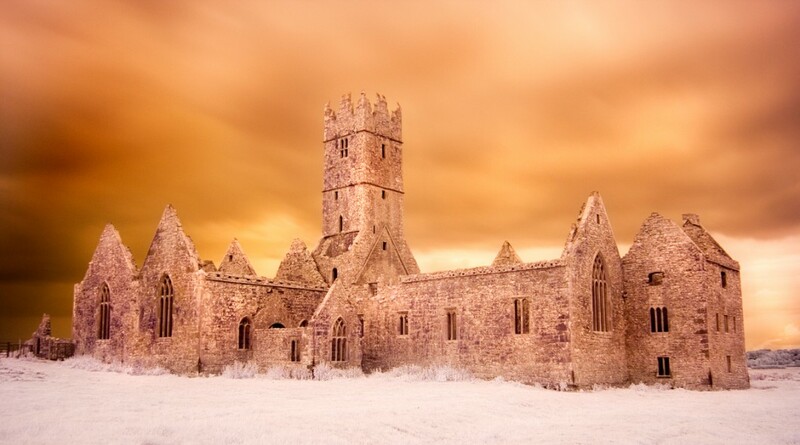 It is among the best-preserved medieval monastic sites in the country. The abbey was founded by Dr. Malachy MacHugh, the then Archbishop of Tuam and a member of the Franciscan order. In 1348 Europe was in the grip of the Black Death. It is said that Archbishop MacHugh had a dream where he was told that in order for his prayers to be answered and the plague to end, he must first build a Friary. He was told to go to the townland of Cordarra in Headford and that a sign would be given to him there. The next day he arrived at Cordarra where he saw three swans soaring overhead, each with a bunch of flax in his bill. The swans landed on a slight ridge near the banks of the Black river. When he reached this spot the swans had disappeared and in their place he found growing the three bunches of flax - all in full bloom even though it was still the depth of winter. Dr MacHugh took this to be his sign and at this spot he built Ross Errilly Friary. Following the Reformation the Franciscan order had strongly opposed King Henry VIII's break with Rome. In the resulting anti-monastic crusade, Ross Errilly was regularly persecuted at the hands of English Authorities; the monks were imprisoned, banished or killed. The monks were repeatedly forced to flee Ross Errilly during the 17th and 18th centuries and the abbey was finally abandoned sometime around the 1750s. By the 1800s Ross Errilly was in ruins. Visitors to the abbey are said to have been greeted by significant amount of unburied human remains strewn throughout the monastery. The abbey is now managed by the Office of Public Works Heritage Services.